Drought affects half of U.S. Whether due to the climate or other factors, damage to our environment can effect our lifestyle, our health, and our wallets. In this section we document some of the effects of this damage. On Nov. 21, President Trump noted a cold week and pondered what happened to Global Warming. Two days later, he got his answer in the 1,600-page National Climate Assessment (NCA). The report - issued every four years by the U.S. Global Change Research Program (USGCRP) - was compiled by 300 scientific experts, 13 federal agencies, and the National Academy of Sciences (NAS). It is "extremely likely" that human activities are the dominant cause, the report states. "There is no convincing alternative explanation supported by the extent of the observational evidence," it states. We can expect to see worsened storms and heavy rains, leading to flooding. Combined with melting glaciers, the earth's sea level has risen more than 7 inches since 1900 - with 3 of those inches in just the past 25 years. "A rise of as much as 8 feet by 2100 cannot be ruled out," the report states. High altitudes have seen reduced snowpacks melting earlier in the spring, contributing to water shortages and more severe fires. Continually warming temperatures would make future years even more dire. "Chronic, long-duration hydrological drought is increasingly possible before the end of this century," the report states. Storms such as 2018's Hurricane Florence caused the Air Force and Navy to evacuate dozens of planes and ships, as well as hundreds of personnel from Virginia's Hampton Roads region. In Alaska, melting Arctic ice is causing buildings and roads to crumble, while shorelines are eroding. In the midwest, increased temperatures are projected to lead to declines in crops and livestock - affecting consumers as well as producers. Fires affect more than those who lose their homes or are forced to evacuate, as smoky air spreads over many miles. Air pollution, floods, water quality, and allergic and infectious diseases such as from mosquitos and ticks affect both mental and physical health. And they don't affect everyone the same. Children, older adults, low-income communities, and some communities of color have less capacity to prepare and recover, and therefore face greater risks. Polluted air kills 7 million people each year and costs society more than $5 trillion, according to the World Health Organization. "The true cost of climate change is felt in our hospitals and in our lungs," the organization says. There had been some improvement. Between 2005 and 2016, the United States reduced carbon dioxide emissions by almost 15 percent - in part due to the Obama administration's Clean Power Plan (CPP). The Clean Power Plan is one of more than 70 environmental policies that the Trump administration has been working to eliminate. Emissions returned to an all-time high in 2018. Though much of that comes from China and India, U.S. policies play a significant role. But greenhouse gases remain in the atmosphere for several decades. So even if emissions were to stop completely, negative effects such as increased temperatures will continue to get worse for at least another 25 years. Trump said he read some of the report, but did not indicate that it would influence any of his administration's policies. The report is long, but most sections are easily readable. Click here to read each section of Vol. 1. Click here to read each section of Vol. 2. U.S. coastal cities are flooding more than ever before due to rising seas, according to a new National Oceanic and Atmospheric Administration (NOAA) report. Overall, 27 out of the 98 cities examined tied or exceeded their individual records for flooding during high tides. The U.S. average flooding frequency has increased 50 percent over the past 20 years. For more, read the Washington Post story and the 2016 News in FiVe article. Click here to read the NOAA report. Drink water? You're probably drinking plastic, too. Any time you drink water out of the tap, odds are you're also drinking plastic. A study by Orb Media and researchers at the Minnesota School of Public Health tested tap water from more than a dozen cities throughout the world, and found microplastic fibers in more than 8 out of every 10 samples. The highest contamination rate was found in the United States - where 94 percent of the samples tested contained microplastics. This included tap water at New York's Trump Tower and the Washington, D.C. headquarters of the Environmental Protection Agency (EPA). Microplastic fibers also were found in bottled water. U.S. tap water averaged almost 5 fibers in each half-liter sample tested. In Europe - where 72 percent of the samples tested contained microplastic fibers - there were just under 2 fibers in each sample. The direct affect on humans still is not determined. However, microplastics have been shown to adsorb toxins in water. And they have been shown to release these toxins into animals that ingest them. One source of microplastic pollution in water - microbeads in personal cleansing products - was banned by the Obama administration. Click here to read about the Orb Media study. Click here to read an EPA report on the toxicity of plastics pollution to animals. As Global Warming causes rain to replace snow in Alps, the ski resorts in the European mountain range could lose 70 percent of their snow by the end of the century. Even in a best-case scenario - if temperature rise is limited to 2 degrees Celcius as specified in the 2015 Paris Climate Change Agreement, Alpine resorts would lose about a third of their snow. 2016 was the hottest year on record - for the third consecutive year. Of the 17 hottest years on record, 16 have been since 2000. The trend of rising temperatures has caused everything from flooding to droughts. The cost to U.S. residents is in the billions of dollars. Although the primary cause of warming has been greenhouse gases from manmade emissions, temperatures the past two years have been further boosted by a weather pattern know as El Ni�o. That pattern has ended, and scientists expect 2017 to be cooler than the previous two years. Minus that effect, however, climate scientists still expect the atmosphere to continue warming. For more on the cost of global warming in the U.S., see the report from the National Centers for Environmental Information. The good news... there's still snow for Santa at the North Pole. The bad news... those days might be numbered. Temperatures there might be 20 degrees higher than average this year, climate scientists report. They link the "heat wave" to climate change caused by human activity. With sea levels rising, coastal flooding has been discussed as a likely future effect of global warming. For some U.S. cities, the future is now as floods can be caused by the simple combination of a high tide and a strong wind. The flooding in eastern states from Virginia to Florida is more than inconvenient. It costs tens of billions of public dollars to mitigate problems the flooding is causing. A flood even just a foot deep can disrupt traffic, damage houses, and poison water wells. The problems are going to get worse soon, according to the National Oceanic and Atmospheric Administration (NOAA). East coast residents are likely to experience more flooding - even on sunny days. The sea also is likely to rise off west-coast states as water stops being pushed toward Asia by changing climate patterns. The issue also affects national defense - especially naval bases. In January, the Department of Defense (DoD) issued a directive on adapting its operations "to address the impacts of climate change in order to maintain an effective and efficient U.S. military". However, in the most recent Defense Appropriations bill, an amendment by Rep. Ken Buck would prohibit the DoD from using funds to implement the environmental directive. Buck's amendment passed (click here to see how your representative voted). The full bill passed the House on June 16. It is not expected to pass in the Senate, however. A replacement appropriations bill may or may not contain a similar provision. For much more, read this New York Times article. Also read this Virginian-Pilot article. 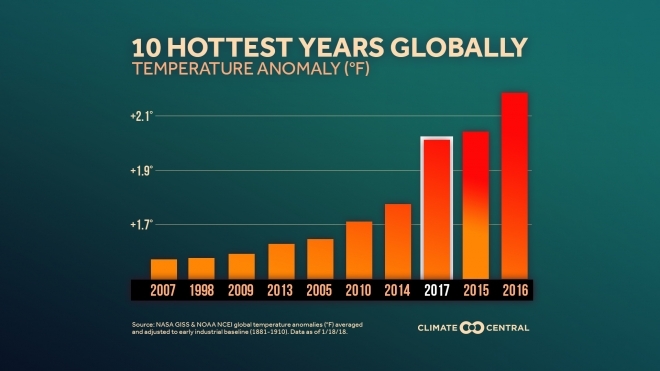 2015 was the hottest year ever measured, according to reports issued by the National Centers for Environmental Information (NCEI) and the National Aeronautics and Space Administration (NASA). The average global temperature exceeded the previous hottest year - 2014 - by more than a quarter of a degree. Scientists began recording temperatures in 1850. A warmer climate can lead to larger storms as warm air can absorb more water than cooler air. But it also can lead to droughts that can threaten the Earth's food supply. To read about the study by the National Centers for Environmental Information , click here. To read about the study by NASA , click here. Expect food prices to rise in the long term due to lower crop yields - the effect of the country's worst drought in 50 years. A reduced corn yield is triggering discussions regarding the use of corn for making ethanol used as a fuel additive, as demanded by the Renewable Fuel Standard. About 40 percent of the country's corn crop is used to make biofuel. For more, including some arguments in the debate regarding using corn for ethanol production, read the New York Times story. An iceberg twice the size of Manhattan has broken off from Greenland's Petermann Glacier. This is the second time in two years that a large glacier has calved in Greenland. In 2010, a 46-square mile glacier broke off. Drought affecting more than half of U.S.
More than half of the continental United States is suffering from the widest drought in more than a decade. For more, read the Los Angeles Times story.